Sure, satellites can track storms and precipitation–but they can also measure snowfall on the ground. 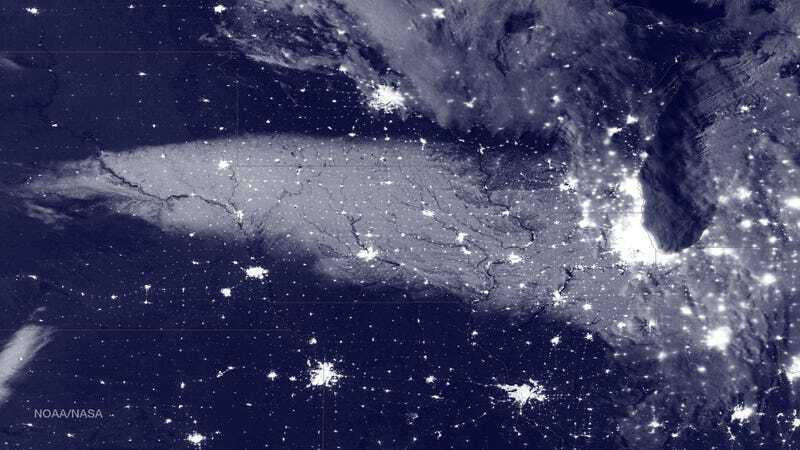 This amazing satellite image shows snow on the ground after this weekend’s record-breaking blizzard, which hit quite a few Midwestern states. The blueprint-style image above was taken yesterday by a weather satellite, the Suomi NPP, using the satellite’s VIIRS (Visible Infrared Imaging Radiometer Suite) instrument. How does VIIRS actually see snow cover once it’s on the ground? It uses a snow cover algorithm that makes a good guess at snow based on specific spectral bands, as the scientists who developed it explain in a paper in the Journal of Geophysical Research. It doesn’t do as well when there are clouds, but when it’s clear? You get beautiful images like this one.